So the time again come again to pay tribute to one of the forefathers of swing music and leader of one of the finest jazz orchestras of the 1920s and ’30s, the incomparable Fletcher Henderson. Fletcher Hamilton Henderson, Jr., was born on December 18, 1897 into a middle class family in Cuthbert, Georgia in a home built by his father. Like so many, Fletcher learned to play piano as a boy, along with his brother Horace, who also went on to become a noted jazz musician and bandleader. Henderson graduated from Atlanta University in 1920 with a bachelor’s in chemistry and mathematics, and thereafter moved to New York City with intention to attend Columbia University. He got sidetracked soon after arriving however, and instead made his entry into the world of Harlem’s jazz music; while lodging with a riverboat musician, Fletcher filled in for him from time to time. He soon began working as a song plugger for W.C. Handy, which led his getting his big break in 1921. When publisher Harry Pace broke with Handy to form Black Swan Records, he made Henderson the musical director for the fledgling “race” label. At Black Swan, Henderson led his first orchestra, and he continued to lead after the company folded in 1923. Henderson began to record prolifically on most every record label in existence, both as a bandleader and as an accompanist to early blues singers. In its heyday, his band often included jazz luminaries such as Don Redman, Coleman Hawkins, and, for a stretch in 1924 and ’25, Louis Armstrong. A car accident in August of 1928 left Henderson with a few broken bones, and by some accounts a depression that caused his work to decline in quality. Nonetheless, his orchestra continued to perform and record for another decade. In 1931, his became the house band of Connie’s Inn, a prominent Harlem nightclub comparable to the famed Cotton Club. As the swing era began to swing later in that decade, rising star Benny Goodman began purchasing arrangements from Henderson for his own orchestra to play; Goodman’s legendary rendition of Jelly Roll Morton’s “King Porter” is practically a recreation of Henderson’s recordings of the same from 1928, ’32, and ’33. He continued to lead his own band as well until 1939, at which point he disbanded his group to join Goodman’s as a staff arranger, but re-formed an orchestra and recorded sporadically throughout the 1940s. A stroke in 1950 left Henderson partially paralyzed, and he retired from music. Fletcher Henderson died two years later on December 29, 1950. Columbia 2586-D was recorded on December 2, 1931 in New York City. The orchestra consists of Russell Smith, Rex Stewart, and Bobby Stark on trumpets, Jimmy Harrison and Claude Jones on trombone, Benny Carter on clarinet and alto sax, Harvey Boone on alto sax, Coleman Hawkins on tenor sax, Fletcher Henderson on piano, Clarence Holiday (that’s Billie’s father) on banjo and guitar, John Kirby on string bass and tuba, and Walter Johnson on drums. First up, Henderson’s orchestra plays what is in a constant struggle with “Copenhagen” for the title of my favorite of their tunes, Smack’s jazzed up fox trot arrangement of the old Paul Dresser waltz “My Gal Sal”. 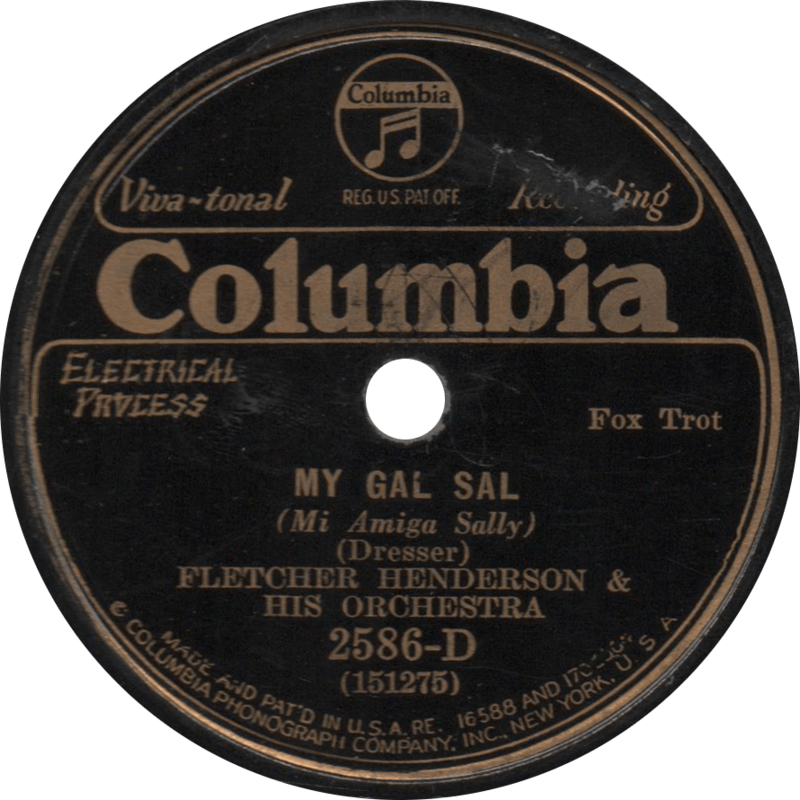 My Gal Sal, recorded December 2, 1931 by Fletcher Henderson and his Orchestra. On the reverse, they play “My Pretty Girl” in a similar manner as Jean Goldkette’s rendition of four years prior, with a vocal by Lois Deppe. 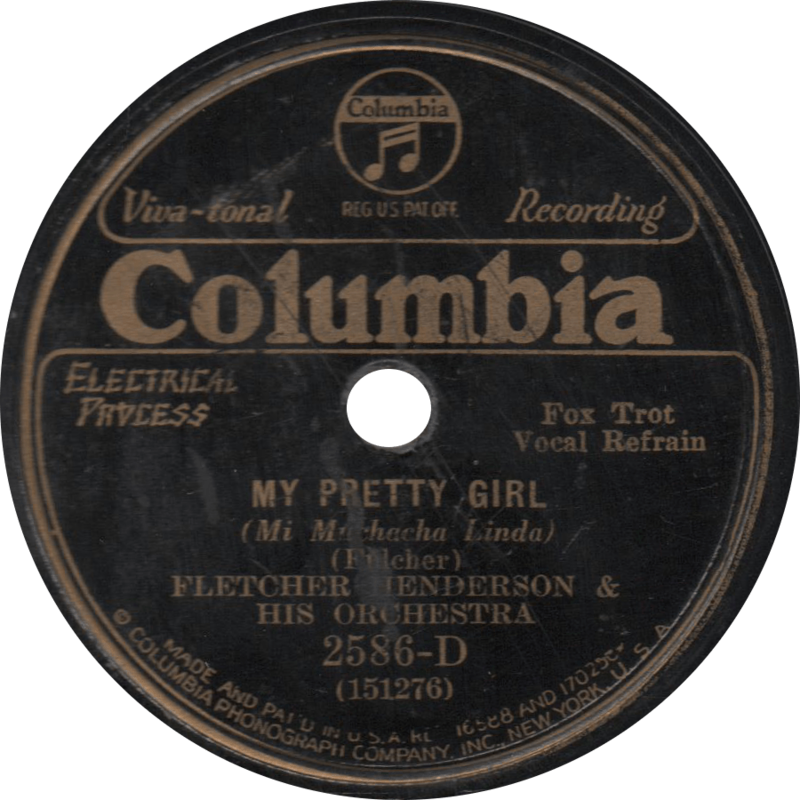 My Pretty Girl, recorded December 2, 1931 by Fletcher Henderson and his Orchestra. In honor of “King” Benny Carter’s birthday, here’s an outstanding Harlem jazz record featuring one of his earliest recorded appearances, as well as a taste of his arranging talent. Bennett Lester Carter was born in Harlem on August 8, 1907. As a child, he was taught piano by his mother, and was later inspired to by Bubber Miley to buy a trumpet. When he couldn’t play like Miley, he decided to take up the saxophone instead. Growing up playing jazz with the Harlem greats, Carter first recorded in 1928 with Charlie Johnson’s Paradise Ten, and played with Fletcher Henderson in the early 1930s. In 1931, he took over leadership of McKinney’s Cotton Pickers from Don Redman, who left to form his own orchestra, and followed in his footsteps the next year with a band of his own. In the 1930s, he began recording with a band under the moniker of the Chocolate Dandies, which had been previously used by a number of others. In 1935, as Louis Armstrong and a number of other jazz musicians had done previously, Carter traveled to Europe, where he played with the Ramblers, Django Reinhardt, and others before returning to the States in 1938. After returning home, he led another band and arranged prolifically. In 1942, Freddie Slack’s Orchestra made a hit with “Cow Cow Boogie”, which Carter wrote with Gene de Paul and Don Raye, and he moved to the West Coast in 1943. In 1973, Carter was a visiting professor at Princeton University for a semester. He continued to play until his retirement in 1997, bringing an end to an eight decade career, and he died in 2003 at the age of 95. Victor 21491 was recorded January 24 and 10, 1928, respectively, in New York City. The Paradise Ten are made up of Jabbo Smith and Leonard Davis on trumpets Charlie Irvis on trombone, Benny Carter and Edgar Sampson on clarinet and alto sax, Elmer Harrell on clarinet and tenor sax, Charlie Johnson on piano, Bobby Johnson on banjo, Cyrus St. Clair on tuba, George Stafford on drums. Lloyd Scott’s orchestra on the flip-side consists of Gus McClung and Kenneth A. Roane on trumpet, Dicky Wells on trombone John Williams and Fletcher Allen on clarinet and alto sax, Cecil Scott on clarinet, tenor sax, and baritone sax, Don Frye on piano, Hubert Mann on piano, Chester Campbell on tuba, and Lloyd Scott on drums. Charlie Johnson’s Paradise Ten took their name from Small’s Paradise in Harlem, where they played. Among their alumni were such luminaries as Jabbo Smith and Benny Carter, who made his first recordings with the band. Their superb “Charleston is the Best Dance After All” was arranged by Benny Carter. 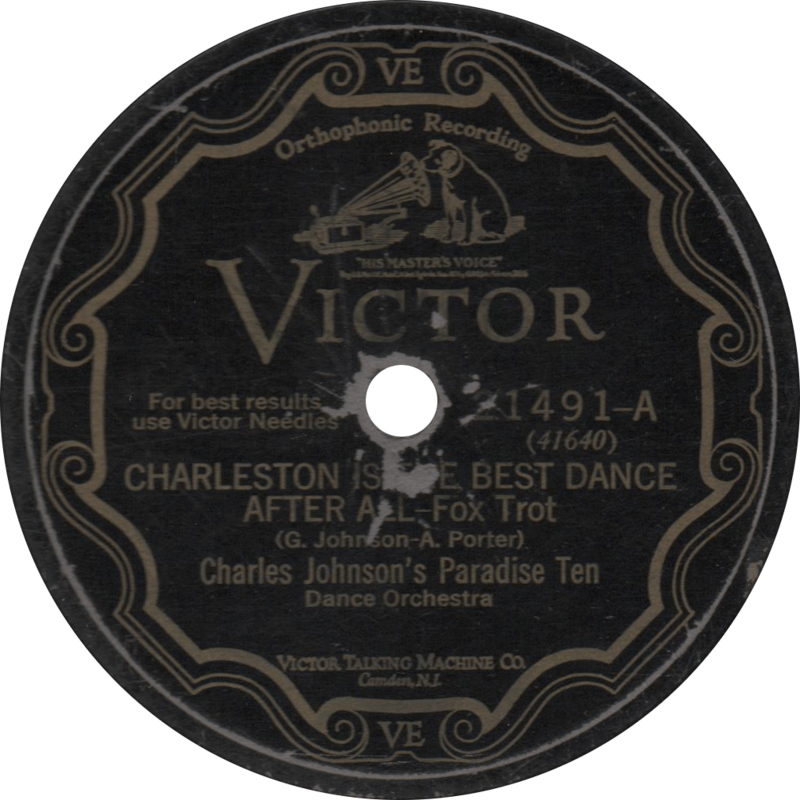 Charleston is the Best Dance After All, recorded January 24, 1928 by Charles Johnson’s Paradise Ten. Lloyd Scott’s Orchestra was another excellent Harlem band, that featured John Williams (husband of Mary Lou Williams) and Dicky Wells. Here they play trumpeter Kenneth A. Roane’s “Harlem Shuffle”. 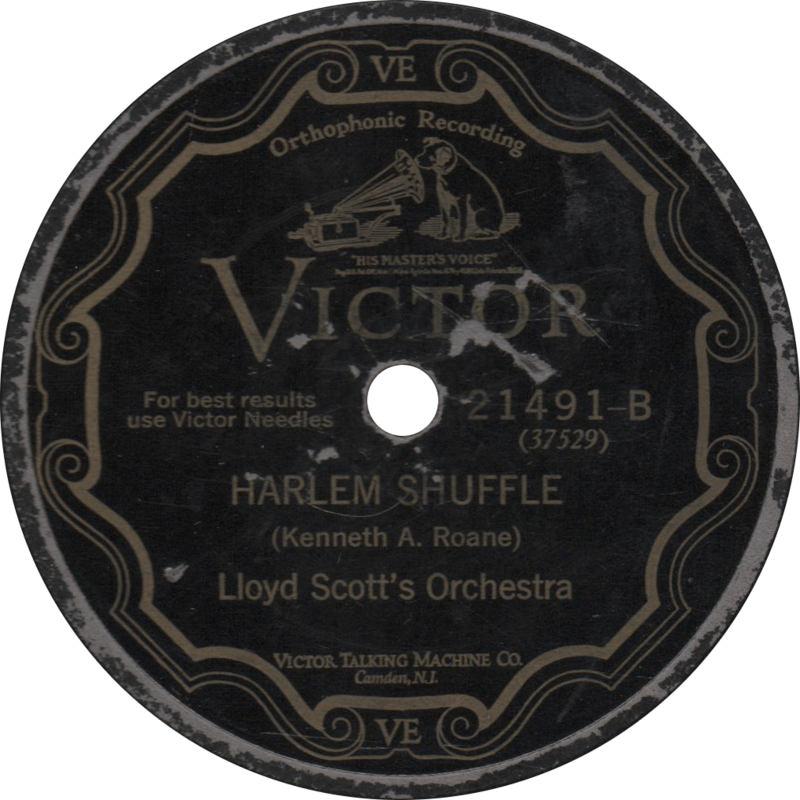 Harlem Shuffle, recorded January 10, 1928 by Lloyd Scott’s Orchestra.